Thai Army Maj. General Khattiya Sawasdipol, aka “Seh Daeng” is dead. He was shot by a sniper on May 13 during an interview with an American reporter and died Monday morning in a Bangkok hospital. I photographed Seh Daeng on May 12, the day before he was shot. The General was something of folk legend in Thailand. He often bragged of his exploits, especially the number of communists he personally killed, during Thailand’s communist insurgency in the 1970’s and 80’s. He bragged about his close connections to the US CIA and he wrote a series of popular action novels. He was very popular in northeast Thailand because he is credited with ending the communist insurgency. 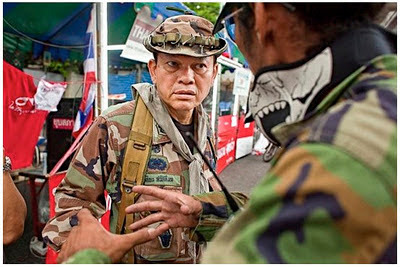 He was promoted to the head of Thailand’s internal security operations command and then he became active in the Red Shirts. The Army Chief of Staff couldn’t fire or demote him (under Thai law that responsibility is reserved for the King) so he did the next best thing. He made the general the army’s chief aerobics instructor. Seh Daeng denied any involvement in the attack. Shortly afterwards a series of grenade attacks fell on Bangkok. Seh Daeng denied involvement but the government continued to imply that he was involved and issued warrants for his arrest. Seh Daeng took on the role of unofficial military commander of the Red Shirts and was the architect of the bamboo and tire barricades the Reds built around their protest site. At one point Red Shirt leaders disowned him and told the government to arrest him if they could. I ran into the general in the Red Shirt camp. I was walking through the camp towards their stage and he was out walking around, inspecting the barricades and talking with supporters. I photographed him for about 20 minutes before he got on a motorbike and rode away. I made some of the last photos of Seh Daeng before he was shot. The next day he was giving an interview to the New York Times at one of the barricades. Someone turned on video camera light to record the interview and as soon as the light came on a shot rang out. Seh Daeng fell to the ground with a bullet through his brain. Seh Daeng has been a huge thorn in the side of the government and his death has to be good news for the people in power. Just the same, the Thai government has denied any role in the shooting of their chief nemesis and said the matter is under investigation. I bet they hire the same Private Investigator OJ hired to find the person who killed Nicole Simpson and Ron Goldman. I was at the Red Shirt camp in Ratchaprasong this morning when his death was announced. People stood in respect. Some started weeping uncontrollably. Others accepted the news in silence. That’s when the photos in the slide show were made. The are more photos of Seh Daeng in my PhotoShelter archive and available from ZUMA Press.